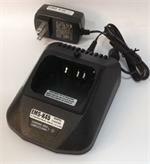 KNB-47L : 7.4 volt 1900mAh rechargeable Li- ION battery for Kenwood radios. Fits the NX200, NX300, TK5220, TK5320, etc. replaces original part # KNB-47L. Re-charges with original Kenwood Li-Ion smart chargers. EMS-K45 : Desktop Rapid-Smart Charger for Kenwood PB-45L etc. EMS-K45: Desktop Rapid-Smart Charger for Kenwood PB-45L, KNB-33L, KNB-33XL, KNB-47L, KNB-47Li, KNB-48Li, etc. Charges battery with OR without the radio attached. Has automatic shut-off. Includes worldwide AC-DC power supply.